This is not proof of the exhibition VDNH of the USSR, and the technology for using wood in engineering, developed in the Voronezh forestry Institute, were awarded medals of the Exhibition of achievements of national economy of the USSR. We offer young innovators, participants NTTM, a short description of the technology according to the materials of USSR national economy. The ancient builders have noticed: it is enough to miss the hammer, hammering a nail into a smoothly planed Board, on its surface is formed a dent. And if another nail falls on the same place, he is harder: a time wood was condensed, became firm. These properties of natural fibrous material has been comprehensively studied by the Professor of the Voronezh forest technical Institute P. N. Muhransky. Research conducted at the Department of drivelinemedia, gave surprising results: subjected to uniform compaction at least under slight pressure, the tree took on a completely new quality allowing it to compete even with metal. 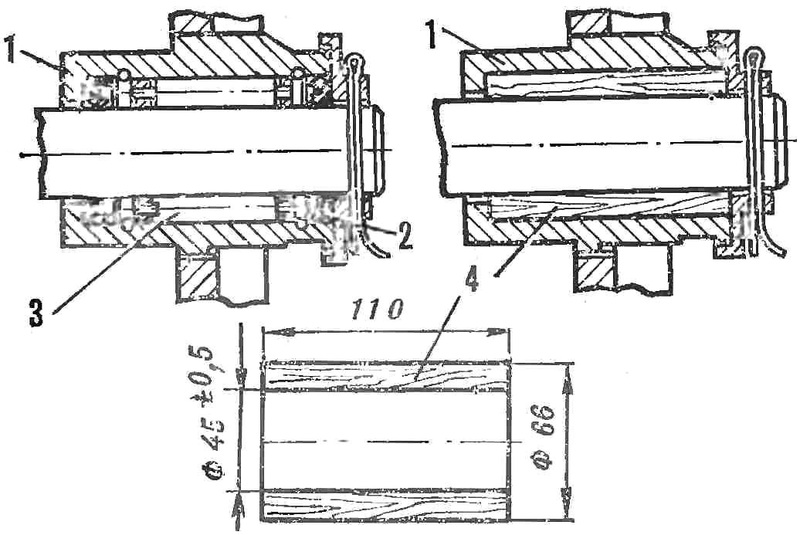 1 — cutting of the trunk on the dirty workpiece 2 — timber harvesting; 3 — press-form the blank into a press; 4 — locking pins are pressed on the workpiece; 5 — billet after extrusion and drying. 1 — markup draft of the workpiece; 2 — cylinder-billet; 3, 4, 7 — washer; 5 — ring; 6 — foster housing; 8 — ready the mold; And the mold with the workpiece under pressure; — A pressed preform; In — press-fitting of the punch; D — workpiece after pressing and drying. All dimensions are given roughly. This cheap, bargain raw materials, which before were good only for firewood and small crafts, was completely new material, possessing great strength and durability. So great that there was a possibility to make him a machine parts, which before were made of scarce antifriction materials: bronze, textolite, special cast iron, babbit. 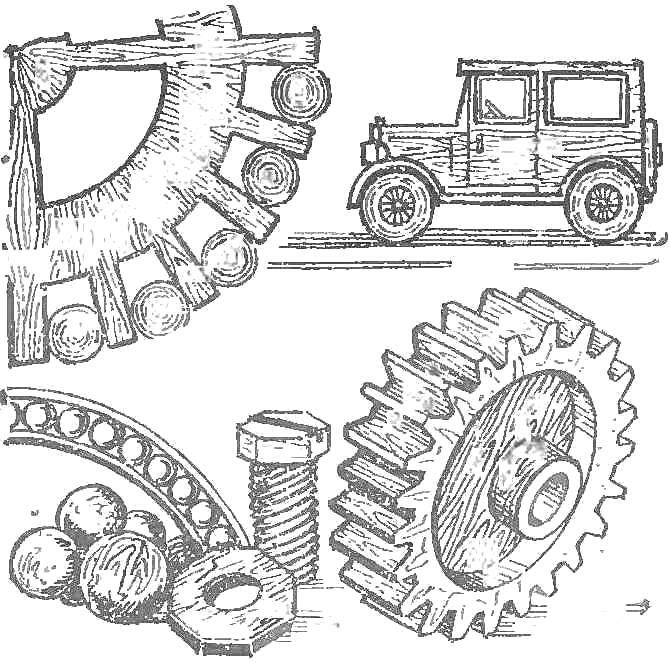 In the forest wilderness, in the areas of timber industry and woodworking enterprises, in workshops, on conventional equipment were born from pressure-treated wood a variety of items for many types of modern machines and mechanisms. In the Urals, for example, the material quickly found use in the reference nodes is a powerful plant and equipment. In Lysva metallurgical plant has used made of pressure-treated wood gears, bearings overhead cranes, galvanizing and tinning machines, sleeve conveyors, belt conveyors. Valuable experience has been gained at the plant “Stroymash” (Sloviansk, Donetsk oblast), where he mastered dozens of different pieces of wood, including the friction of such commercially available machines, such as mixers, that have saved a large number of bronze, cast iron, improved the durability of equipment. Logging enterprises in the Leningrad and Novgorod regions built special plants for the production of press wood parts from wood waste. In Borowiecka the timber industry, for example, arranged the production of the hollow cylindrical bearings and bushings. 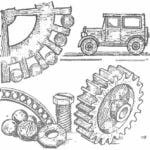 These items are made of birch, well withstand loads associated with friction protects metal parts from quick abrasion, long hold grease. 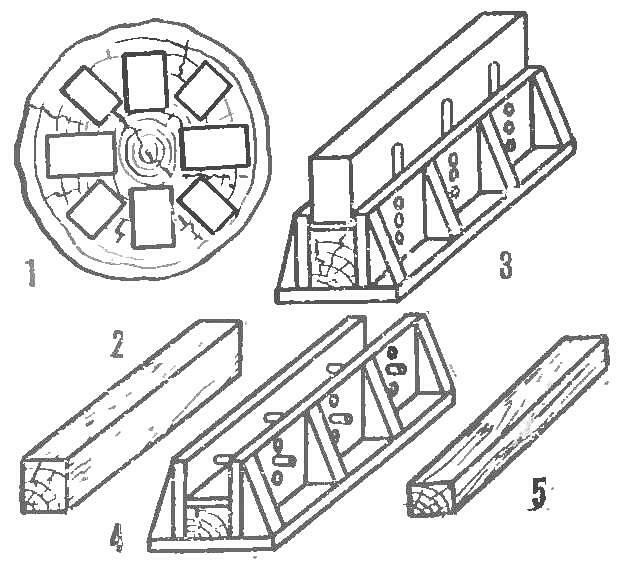 In a flail cost birch bearings is many times lower bronze and even textolite. Practice has shown that melkooptovom steel rolling mill, for example, the bronze bearings serve 15 shifts from PCB — 40. and a stacked liner of pressure-treated wood — 50 shifts. With wooden details not only blur, but even polished metal shafts in operation. It is known that the friction at high speeds heat up, and the tree is much worse conductor of heat than metal. Hence, the inevitable overheating! No. Here helps another property of press-wood: made of details work great on the grease… water. The water at the same time plays the role of the cooler outlet excess heat. This grease is applicable for stacked bearings, in which the wood works its end surface. Especially effective proved to a tree in the friction of pieces of farm equipment, constantly lag land and forest. In the Voronezh region, press-wood recovery of parts and components of agricultural machines is one of the first to apply Talovskiy Association “agriculture”. The tree is reliable in plows, seeders, tractors and spiky rollers, plows, cultivators, harvesters. 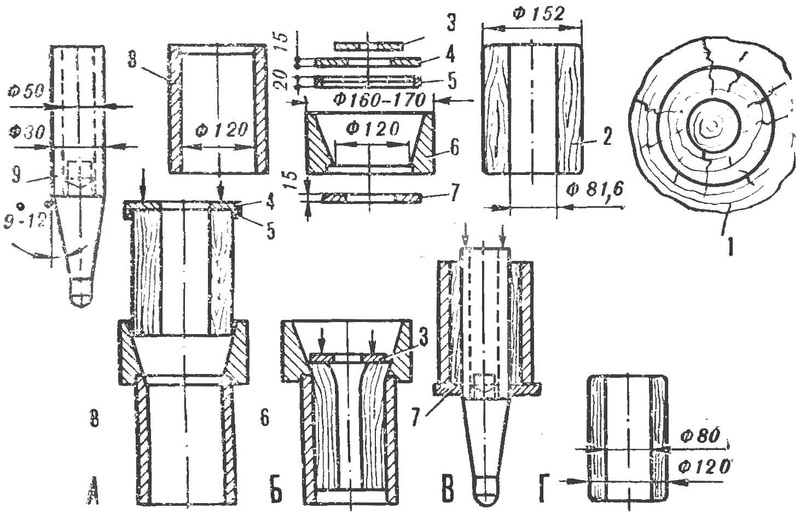 1 — bearing housing, 2 — samopoznanie epiploon; 3 — the needle bearing; 4 — wooden bushing instead of a bearing. Fig. 4. 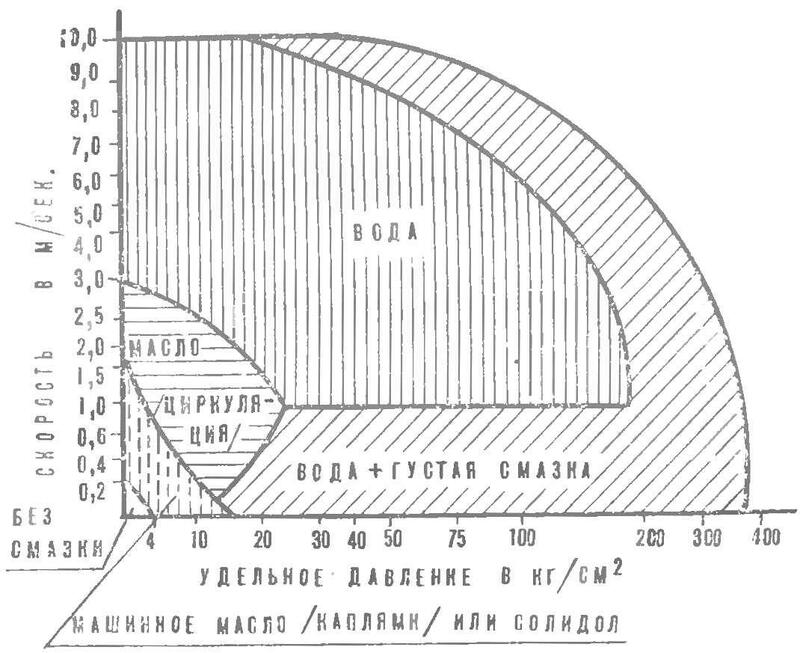 Graph allowable loads and selection of the lubricants. The pressing consists of the following operations. 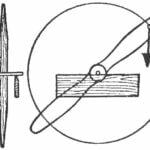 Of appropriate diameter and length of the portion of the tree trunk in circular sawing and turning machines to get the rough blanks for the uniaxial (Fig. 1) or to contour (Fig. 2) pressing. They are three-time steaming at a temperature of 100-110° for 30 min. when the thickness of the workpiece 10 mm, or up to 140 min., in thicknesses up to 40 mm. Three steamed workpieces placed on racks and kept in a dry place for 3-12 days. The wood moisture content is reduced to 16-18%; shrinkage 5-6% of the original size of the workpiece. Directly before pressing rough blanks again steamed to increase the elasticity of the wood. “Bath” lasts depending on the thickness of the workpiece from 8 to 25 min. or more at temperatures up to 95°. Then blanks for uniaxial pressing lays in shape (Fig. 1) and installed under the press, then slowly increasing the pressure. Pressed workpiece is fixed in a package with studs and aged in a drying chamber until then, until it is easy to fall out of shape. For contour extrusion of hollow billet after steaming lubricated inside and outside avtolom or a mixture of graphite or talc. Then the workpiece is put on a ring, to prevent the end from cracking, and place the washer (Fig. 2). The press set the form in her foster cone, in which oiled and guide the workpiece. After or in the workpiece is pressed to the punch. Speed or — 200 — 300 mm/min. Billet molds are dried in chambers at a temperature of 110-130°, until it is easily removed from the mold. The plug housing is pressed to the recess of the workpiece, so as not to damage it, as stress can reach 1 T. For protection from subsequent cracking of the resulting workpiece is covered with a thin layer of paraffin or put on 30-40 minutes in the heated oil, and then in the cold. Now the workpiece is suitable for machining and manufacturing parts on conventional machine tools. The cost of the parts from pressure-treated wood 5-15 times lower than bronze.